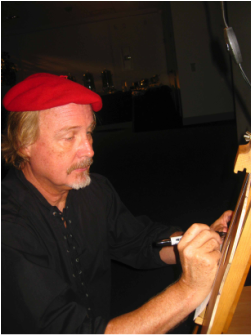 Michael Angelo "Michaelangelo" has 45 years of experience as a caricature, portrait, and silhouette artist starting in 1972 at Disney World, Orlando, Fla. , The Brown Derby, & Busch Gardens, Tampa Fla, working summers while earning his B.F.A. from F.S.U., Tallahasse, Fla. In 1976 he moved to New York to work at ABC-TV as an animator and drew caricatures at The Tavern on the Green and Sardi's on nights and weekends . After winning an Emmy award in 1984 for ABC's LA Olympics Animation, he moved to Los Angeles, Ca. and drew caricatures at Universal Studios, Los Angeles and at Disneyland in Anaheim, Ca.. while freelancing as a 3D animation artist in Hollywood. Clare reads palms and accompanies Michael to many events, providing insights into life, love and relationships. She is from Russia and learned to read palms from her Grandma. Clara met Michael in New York, as she was getting off the boat on Staten Island. Over coffee, she read his palm and predicted their marriage. Within a year, they were married and now have a son, Victor, now a U.S. Supreme Court lawyer and a daughter, Alexandra, who is a Director of Marketing at Google. BEFORE PROFESSIONAL PARTY PLANNERS BOOK US FIRST! WEEKENDS AND HOLIDAYS BOOK FIRST AND FAST!